Mini hopes to attract new customers to the brand because, its says, 70% of global subcompact hatchback sales are for 5-door variants. OXFORD, England -- Mini brand will unveil its first five-door hatchback at next month's Paris auto show. With the Mini five-door, the BMW-owned brand is targeting customers who want something bigger than the three-door Mini but don’t want to switch to the larger, SUV-styled Countryman, which also has five doors. Mini expects the five-door hatchback to attract new customers to the brand because, it says, 70 percent of global subcompact hatchback sales are for five-door variants. The Mini five-door will go on sale in Europe on Oct. 25. It will be sold as the Mini Cooper hardtop in North America and will arrive in U.S. dealerships in January. Like the five-door version, it is being built at Mini's main plant in Oxford, England. Besides the two additional doors, the five-door has three seats in the rear, as well as more headroom, legroom, and load capacity than the three-door Mini. It keeps the styling of three-door and its "go kart" driving dynamics but it's longer with a wheelbase extended by 72mm. At 3982mm, the five-door is 161mm longer that the three-door variant. Trunk capacity is increased by 67 liters to 278 liters. The five-door should give Mini a sales boost. 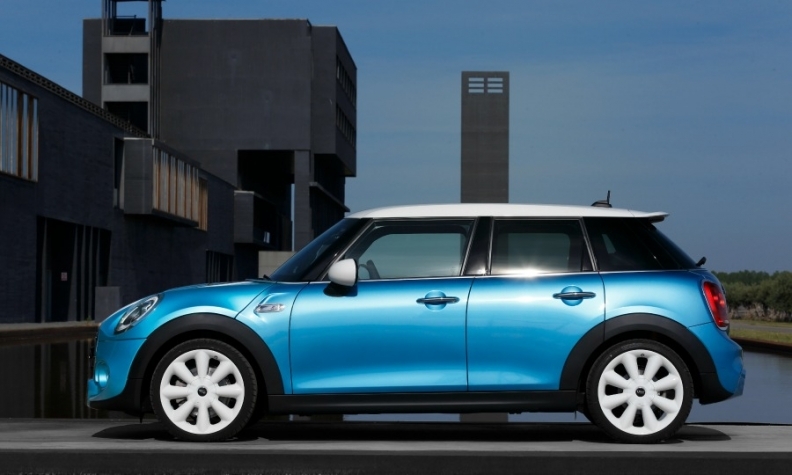 Global sales of Mini vehicles fell 9 percent to 175,658 vehicles during the first eight months. In August, sales dropped 6 percent to 19,504. Last year, Mini sold a record 305,000 vehicles worldwide. In an interview in June with Automobilwoche, a sister publication of Automotive News Europe, BMW CEO Norbert Reithofer attributed the sales decline to the model changeover for the brand’s core car, the three-door Mini. The latest-generation three-door variant went on sale last November underpinned by BMW's new UKL front-wheel-drive architecture that also underpins the BMW 2-series Active Tourer and will be used for the next BMW 1 series. The five-door is the second Mini variant to use the platform. Mini is expected to replace the station wagon-styled Clubman with a five-door wagon, also underpinned by UKL.